Long on luscious closeup photographs trembling with sunlit dewdrops, expressing the exquisite beauties and intelligences of flowering nature, this gift of a book is at heart about blossoming yourself as much as it is about creating a garden. Highly inspirational, it will expand and deepen your “sense” of what gardening is all about, and what it offers us humans in terms of both nourishment and co-creativity with Life. 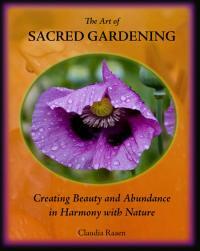 With specific activities to explore—sensitizing, opening, and getting-your-hands-dirty—the book is organized in nine “Gates”: Seeding Your Intent, Your Inner Attitude Conditions the Soil, Ask and Receive Before You Sow the Seed, Declaring Sacred Space Within and With-out, Gathering Your Sacred Ingredients, Designing with Nature, Nurturing Your Garden with Beauty, The Balance of Nature, and Celebration, Ceremony & Rest. “You can dream up a Sacred Garden that is just right for you. It could be a small container garden spilling out with colour and fragrance, a bountiful backyard garden, a kitchen herb garden, a wild medicine garden, a self-sustaining family domain or a beautiful bed of flowers.